Ok, it's not really a capsule, it's more like a whole bunch of purple stuff, some of which happens to coordinate. And many of the pieces are made with bit of fabric left over from previous projects. #Sewingleftovers for the win! Getting clear photos of my niece wearing the clothes... less of a win. But let's roll with it. First item: A Chalk and Notch Waterfall Raglan made from rayon lycra jersey from Joann, left over from my Blanc Tee hack. 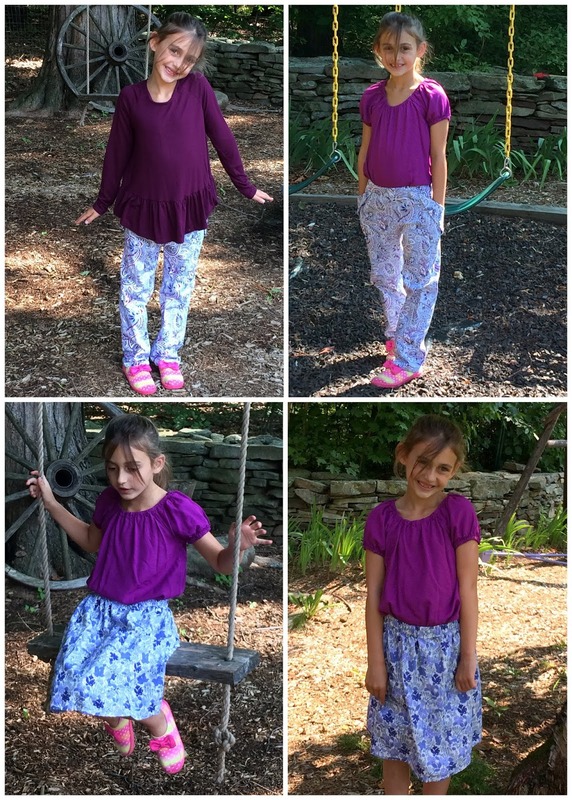 This is such a cute pattern... comfy, ruffly, purpley. I'm happy with the fit, too. This is the blouse version in a size 8 with long sleeves. I think it will work well all fall, whether paired with pants or leggings. Second item: An I Think Sew Ella Raglan Blouse in rayon challis left over from my Style Arc Mila dress. This little peasant blouse pattern has served me well over the years. It's great in a variety of fabrics, easy and quick to sew, and just plain adorable with its swingy hem and elasticized sleeves and neckline. This is a size 7. Third item: To pair with the Waterfall Raglan and Ella Raglan Blouse, some purple paisley Compagnie M Noa trousers. The fabric is stretch cotton twill, I think, from my mom's stash. It may also be a sewing leftover since it had some tell-tale cuts on one end. These are size 7. I think they turned out really cute. I love the pockets, although they are difficult to see in this fabric. I may make her another pair with contrasting pockets to show them off. The twill made the pockets a teeny bit bulky; next time I'll use something lighter weight. Fourth item: This piece is the oddball that doesn't really pair with the other purples, although my mom put them together for these photos anyway. The quilting cotton is left over from the Polly tank top I made my sister a couple years back. It's a simple width-of-fabric gathered skirt with an elastic waist and big patch pockets, loosely based on this tutorial from Made Everyday (you'll recall I made my nieces this same skirt a few years back). Super simple but satisfying to make! I hope this kid enjoys her new purple wardrobe! Just to be clear: I also gave this up and coming second grader books, too, because I am a responsible aunt. Lots of books, old and new. Very nice! I know your niece enjoyed all the things you sewed for her, she looks happy! Thanks!! I think she liked the stuff, too! Yay for the books! (I'm a first grade teacher) and YAY for the cute clothes! It's always so nice to start school with some clothes you feel really good in. You are a good auntie. Yes! I was so excited that she actually asked for books for her birthday... so I got her the ones she wanted (Junie B. Jones) and the ones I wanted (books from my childhood). Thanks!! I love using up those little leftover bits!! Ha ha- she would love to know that you're also on Team Purple, Abbey! Your niece looks so happy and comfortable! It's so fun to have a splash of new clothes for the beginning of the school year, and it looks like she can really play in these! Yes! I was trying to make them fun but practical! And purple to make her happy!